This painting with its memento mori, reminders of mortality, and allusions to meta-reality is a still life study painted on board. There are reoccurring themes in this type of illusionistic art which have been used since the 17th century. Vanitas symbolism occurs in modern paintings and art as well as in 17th century figure paintings. In accordance with a tradition going back to the fifteenth century the painted trompe-l'oeil is signed on a cartellini, a slip of paper within the picture itself. It is considered to be the case that the genre emerged in the 1650's in Holland from the circle of Rembrandt. 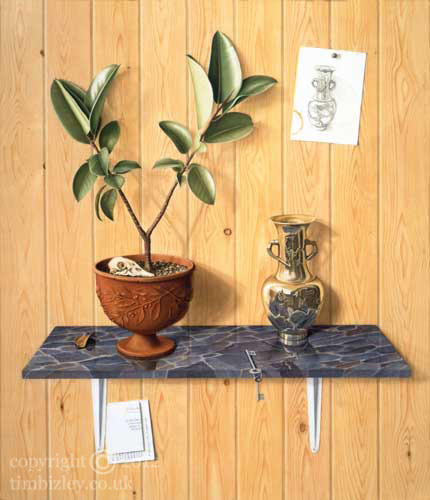 Painted trompe-l'oeil pictures are available by commission.